Long before they met, Dr. Steven and Dr. Elizabeth Russell had something in common... a sense of adventure. And it was this passion for adventure that lured the couple from the comforts of their southern Ontario homes, on a 5,000 km drive to Yellowknife, Northwest Territories, to begin their exciting new careers as general practitioners of medicine. Both of the Russells grew up and attended schools in medium sized Ontario communities, Steve in Oakville and Elizabeth in Cobourg. Then it was off to university. For Steve it was the University of Western Ontario in London, and Elizabeth at Queen’s University in Kingston for undergraduate studies. And while Steve attended the University of Toronto to complete his medical degree, it was during his postgraduate training in Family Medicine at Queen’s that he first met Elizabeth. She had attended Queen’s and completed her medical school training in Kingston. 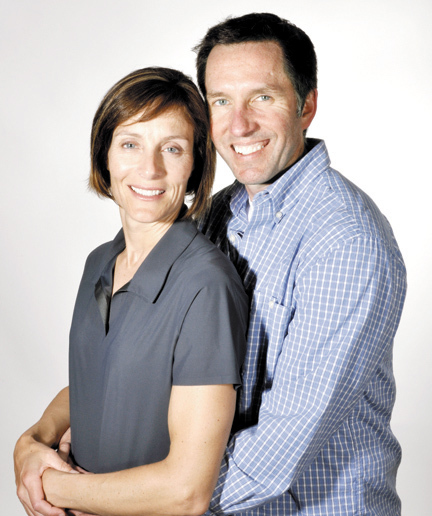 Elizabeth and Steve met in 1989 and after a one year courtship they were married. Steve continued his final year of schooling while Elizabeth stayed on in Kingston, taking additional training. Finally finishing school in 1991, the young couple began searching medical journals for an “adventure.” They considered opportunities in Sioux Lookout and Dryden in northern Ontario before settling on Yellowknife, Northwest Territories, far north where the tundra kisses the Arctic. Packing all their worldly possessions into a trailer, the adventurous couple began the 5,000 km trek northwest, eventually settling in a cramped cabin on a small island connected by a narrow causeway. Originally planned as a three or four month stopover, the Russells ended up staying in Yellowknife for two full years, giving birth to their first son, Peter, while living in the remote cabin. Despite the isolation and harsh, long winters, they loved the far north. “We really liked the people. They were very friendly and welcoming,” Elizabeth recalled. In addition to administering medical services to the people of the territories, the young ‘docs’ were also required to fly into small, remote communities for delivering babies and attending emergencies. Elizabeth noted that while they were in these remote areas they provided teaching and training for residents and nurses in the communities. “We stayed on much longer than we had planned before finally deciding, with an eight-month old son, we wanted to be closer to our families,” says Elizabeth. Not long after making the decision to leave the north, they packed up and returned to Ontario. It was a chance meeting with people from Port Perry that determined their next stop. “We had met a family while in Yellowknife who suggested we check out Port Perry,” Steve said, so when they returned they decided to investigate the town and its facilities. Not that Port Perry was the only town they considered. After scouting out a number of small communities, including Lindsay and Cobourg, they settled on Port Perry because they found the town very welcoming. After attending a Medical Associates dinner, at which they met many of the local doctors, the decision to settle in the town and begin working was easy. After renting a house in town for one year, the Russells purchased their first home on Queen St. and settled into the community and their new practices. From the very beginning, the couple had decided to share their working hours so they could spend quality time with their young family. So Steve and Elizabeth offered the Medical Associates group their services as a ‘split-practice’, with each of them working half a day. Now, 16 years after beginning their practices at Medical Associates, they have nothing but great memories with their decision to come to Port Perry. “This is a great community for raising a family. We came here looking for a small, comfortable town and we found it,” Elizabeth says. In addition, they both enjoy the variety of choices they have in a small community like Port Perry. Being part of a group, they share shifts and duties in the emergency room, walk-in clinic, palliative care and the operating room. “The variety of duties available here makes life far more interesting,” says Elizabeth. And although they both practised obstetrics for the first 10 years, neither provide that medical service any more. “There are doctors here now who specialize in obstetrics,” Elizabeth explains. In addition to their busy practices, the Russells have also immersed themselves into the community in other ways. They have both devoted time to coaching hockey, are active in the church community and have taken part in various events like the Terry Fox Run, Scugog Choral Society and fundraising for the library. Another of the Russells more recent interests is their work with Feed the Children Canada. They, along with other local medical professionals, have teamed up a number of times to bring medical care to the people of third world countries, most notably in Central America. The busy couple have taken part in a number of one-week missions, bringing care to impoverished people in Honduras, Guatemala and El Salvador. Both Steve and Elizabeth say the trips make them feel more grateful and aware of how lucky they are. “Our reward is being able to help others. We get as much out of these missions, as we give,” Elizabeth says. Steve adds that the ‘big picture’ is overwhelming when it comes to the needs of the people, but also finds their individual stories are very compelling. Since taking part in these medical missions, Steve has written extensively about the medical teams and the impact they have on the people of Central America. The descriptive and informative articles have been published locally in the Port Perry Star. Although the challenges presented to medical practitioners is always changing, they say that basic treatment is much the same today as when they started their careers years ago. “We have a very supportive, positive community and we are proud of the way everyone looks after each other,” Steve contends.